The best known dendroglyphs in the world are located on the largest of Chatham Islands – Rehoa. The largest group of dendroglyphs – Hapupu dendroglyphs is found in J.M. Barker National Historical Reserve. In late 1998 here were found 82 trees with 98 carvings. Exact date of arrival of Polynesians to Chatham Islands is not known – this might have happened around 1500 – 1550 AD (late linguistic analysis shows that it may have happened a bit earlier). Most likely they came from New Zealand. Key figure in the history of Moriori is chief Nunuku Whenua (the 16th century?) who declared that any fighting should end with the first blood drawn. Moriori since then have not broken this covenant. This Polynesian culture is based on peace and respect to nature. Several centuries long peaceful life ended with tragedy. In 1835 there arrived Maori from New Zealand and ruthlessly eliminated the original culture of Moriori. Drawings of dendroglyphs / W.T.L. Travers, 1876. Little evidence remains of the material culture of Moriori: just a few petroglyph places, heaps of shell middens and the unique dendroglyphs – rakau momori. Dendroglyhs are drawings – incisions in the bark of trees. They are not unique to Chatham Islands. Tree carvings with spiritual significance have been characteristic for aborigines living in present day New South Wales, Australia. In some rural districts of Latvia and Estonia there still is a tradition to mark a death of close people by a making a cross in a certain tree. Many aspens in western United States are adorned with incised drawings (arborglyphs) made by shepherds and hunters. Nevertheless Moriori dendroglyphs have special fame – they characterise whole extinct culture. Purpose of these highly unusual carvings is not known and their symbolics – not fully explained. Drawings of dendroglyphs / Dendy, A. 1901. 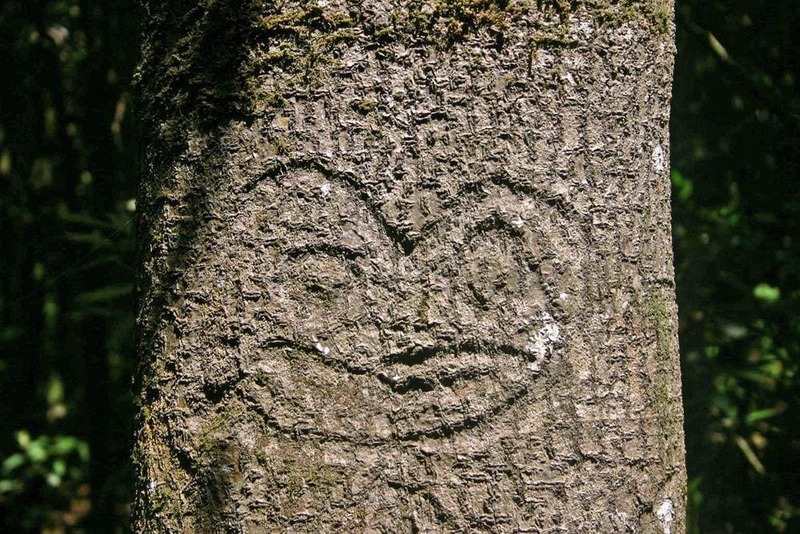 All Chatham dendroglyphs are made on the bark of living kopi trees (Corynocarpus laevigatus). Most likely there are not native trees in Chatham Islands – they seem to be brought here by the ancestors of Moriori from New Zealand. It looks that these trees have special spiritual significance to these people. Kopi trees have thick but soft bark – they are well suited to make cuts. For most part Moriori waited until the trees grow large enough. There are though cases when carvings were made on young trees. Later, when such tree grows, the drawing is extended beyond recognition. Carvings always are located close to sand dunes and always close to large piles of middens – close to Moriori settlements. There is not pronounced orientation of drawings towards one direction. One tree may have up to four drawings. One of Hapupu dendroglyph trees had four drawings – but it was a dead stumb in 1998. If some tourist website announces that Chatham dendroglyphs are 1,000 years old – this is absolutely wrong. If Moriori brought kopi trees with them, first saplings of this tree started to grow around 1500 – 1550 AD. Carvings were made in large trees – thus there can not be a carving made before the early 17th century AD. Drawings of dendroglyphs / Skinner, H.D. 1928. It is believed that the rakau momori tradition ended after 1835, with the arrival of Maori. There are though some stories about old Moriori people who made incisions even in the late 19th century. Images from the 19th century show that Moriori people cared for carved trees – there was removed undergrowth around the trees. Thus today we see carvings which were made not earlier than in the 17th century – but most likely in the early 19th century. 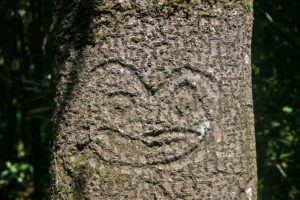 Since the early 20th century the number of dendroglyph trees has decreased many times – thus we can assume that by now only the late carvings remain and in one – two generations they will be gone as well. Landscape of Chatham Islands changed due to grazing and subsequent wind erosion. These factors contributed to the loss of many dendroglyph trees. Already by the 1940s many local people believed that all dendroglyphs are gone. Nevertheless specialists came and proved the opposite. In the late 1940s there were found numerous fallen trees with carvings (3). At that time dendroglyphs were found in 31 different places of Rehoa island and one place (Te Puinga) on Pitt Island. It is rumoured that in the 1950s – 1960s D.R. Simmons from Otago Museum managed to find 1,400 carvings. Last large scale review was made in November – December 1998 (1) when 147 trees were found in five locations around the Rehoa island. Authors of research were unsure whether all trees were found. Part of the finds could be deceptive: markings in the trees could be made by natural factors – such as wines. In Hapupu were found 82 trees with 98 carvings. Nature reserve of Hapupu grove was made earlier – this land was granted to state by Barker Brothers Ltd. in 1979. In 1980 this area was fenced to prevent grazing. Now the grove is called: "J.M. Barker National Historical Reserve", the area is 33 ha. A tourist trail leads through the grove and several trees with carvings are visible from the trail. For most part carvings show stylised humans. Many representations of humans have ribs: not unlike the "X-ray art" which is characteristic for the whole Pacific region. It is possible that at least some of the symbols show the dead people of Moriori. Some carvings seem to show people with knees pulleed to the chest – just like Moriori buried their deceased ones in dunes. Researcher C.Jefferson (3) hypothesized that human figurines represented certain deceased people and Moriori artists in a stylized way depicted charateristic features, habits and personal touches of these people. Besides the human figures carvings show also zoomorphic figures – flounders, birds. On a Pitt Island there was also a carving of seals. There are also tree-like symbols, weapons. Many trees have horizontal ring-like carvings. Two more Chatham dendroglyph sites are described by Wondermondo: Taia and Kairae Lake. Fraser W. Jopson and Craig R. McKibbin, Moriori tree carvings. Close-range photogrammetic record and survey, Department of Conservation, September 2000. Accessed 06.01.11. John W. Dawson, New Zealand Botany with a Difference — The Chatham Islands, Tuatara, Vol 31, Issue 1, July 1991. Image of a tree with at least 3 symbols. Accessed 06.01.11. Christina Jefferson, The Dendroglyphs of the Chatham Islands, The Journal of the Polynesian Society, Vol 64, No 4, pp. 367 – 441, 1955. Accessed 06.01.11. Like many remote islands of the Pacific ocean, Chatham islands are endowed with many unique species of plants and animals. But the greatest international acclaim have acquired unique monuments of culture – dendroglyphs which were created by Moriori people in the 16th – 19th centuries. Mysterious dendroglyphs as well as some petroglyph sites serve as a testimony of this interesting culture. From the Chatham Islands/ Rekohu to London, from 1835 to the 21st century, this quietly powerful and compelling novel confronts the complexity of being Moriori, Maori and Pakeha. In the 1880s, Mere yearns for independence. Iraia wants the same but, as the descendant of a slave, such things are hardly conceivable. One summer, they notice their friendship has changed, but if they are ever to experience freedom they will need to leave their home in the Queen Charlotte Sounds. Revised and expanded to include up-to-date information, this new edition describes the Chatham Islands with emphasis on their geology, flora, fauna, habitats, and extinct and endangered species on land, in freshwater, and in the sea. Beginning with an introduction to the human history of the islands, this guide enumerates the many reserves and covenants that have been established to protect and conserve the islands’ heritage.